When we decide to bring a dog into our lives, thoughts turn to puppies. 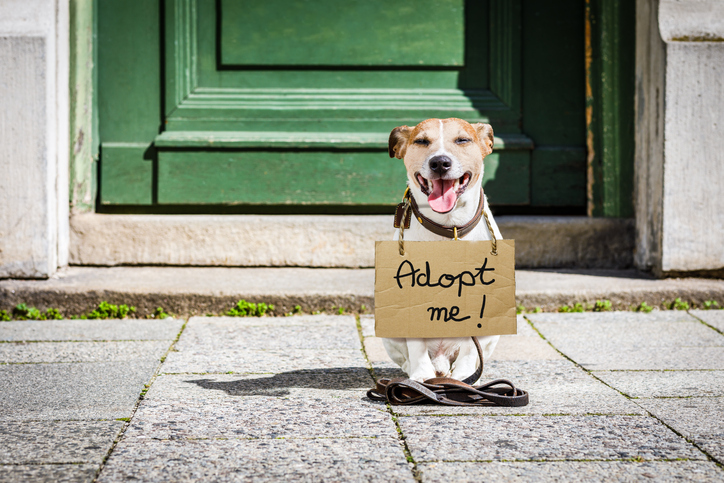 But how many people first think about adopting a shelter dog? While excellent breeders exist, the fact cannot be escaped that they’re outnumbered by those who are breeding merely to cash in on a booming business - the worldwide puppy business is huge. Consumer demand is driving a whole lot of suffering, from puppy mills to backyard breeders, to those who care more about the money their dogs make them than anything else when someone buys a puppy today, they risk sustaining great cruelty. One way to reduce the cruelty is to stem consumer demand. Among ways to achieve this is by encouraging adoption. Heading out to local shelters to look for our new friends is not considered frequently enough, despite a good chance that the perfect dog will be there, patiently waiting for someone to come along and take them home. It’s a huge shame more of us don’t do it, both for the dogs that have to stay patient - or worse, lose their lives waiting - but also for families who miss out on dogs who have deep wells of love storing up, just waiting to share. Dogs love to love even if they are temporarily homeless. It’s easy to misunderstand what adopting a dog involves. Too readily possible challenges are focused on while overlooking the great rewards. People dismiss the idea citing reasons such as not wanting the trouble of someone else’s ‘problem dog.’ But so often dogs are simply homeless, not a problem. A lot of myths, wrong ideas and consumer impatience drives the puppy industry and damages the chances of millions of homeless dogs. Although adopting a dog may not be possible for absolutely everyone, it really is possible for us all at least to consider doing so. Sometimes people won’t consider adoption as they assume puppies aren’t found in rescue but this is far from the truth. Sadly, many female dogs end up in shelters when pregnant and deliver their puppies there. Puppies also end up in rescue when owners have bought them impulsively, without thinking about the work involved, quickly giving up and handing them over to others. Dogs land in the laps of rescuers for many reasons, most often none of which are to do with the dogs themselves. Our modern society is tough for dogs and reasons for dogs ending up in rescue reflect this: marriage breakdown, housing issues, change in working lives, death or illness of owners, inability or unwillingness to train, bad choice of breed for lifestyle or experience, or just plain boredom with the puppy that is no longer cute, all factors commonly lead to dogs being relinquished. While some dogs do have behavioural issues, they are so often created by circumstances: a lack of socializing, training, effort and commitment on the part of their previous owners. Good shelters properly assess dogs in their care and offer adoptive families help, support and backup to work through any issues. Dogs require commitment, effort, and understanding, whether they start their life with us from puppyhood, or when older. People often fear an inquisition and are not willing to have shelter staff scrutinise their life and cast judgment on their suitability to adopt. This is a shame, as good rescues go through detailed assessments in order to match the best pet for the circumstances. By going through a detailed assessment, it helps to ensure that for both dogs and humans involved, adoption is a success. If the assessment from rescues is off-putting, decent breeders do much the same with any potential puppy buyers – if they don’t and are willing to sell a puppy without question, then alarm bells should ring loud and clear, as good breeders care about where their puppies are going and will scrutinse and judge the same as any good shelter. Another reason people dismiss rehoming as an option is that they fall in love with a particular breed. Breed rescues exist, it just takes some research and purebred dogs and those with sound pedigrees find themselves handed into rescues all the time. So, for those who do their homework on which breed is right for their lifestyle and set their heart on their particular breed, buying a puppy is not the only way to bring one into their lives. A bit of time and effort and homework is all that is needed. The most direct way to avoid supporting the cruel puppy business is to adopt a dog. That way, we can at least be certain that we are not supporting a business that churns out puppies for easy cash with no scruples as to the welfare of the puppies or their parents.